New Years + New Year’s Resolutions = New Outfits. At least that’s what we like to think! 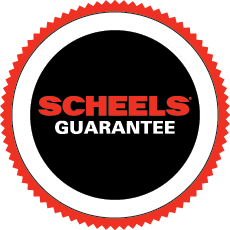 We spoke with SCHEELS expert Jennifer Linke, the Women’s Athletic Clothing Shop Manager from Fargo, North Dakota. Jennifer selected her top SCHEELS “athleisure” picks that will help you look and feel fashionable at the gym and on the street. Take a look at Jennifer’s top athleisure outfit picks below and shop your favorites at your local SCHEELS store or online at scheels.com. The Under Armour Threadborne V-Neck Tee allows for an easy transition between gym style and street style because of it’s Threadborne technology and flattering fit. The material is lightweight, soft and contains built in anti-odor fabric. It also comes in any color you can imagine to match your outfit! For a bottom, I chose the Under Armour Heat Gear Armour Legging. This legging is part of the Heat Gear Armour family – so it is a compression legging that allows for better blood flow. Just like the Tee, it is lightweight, soft and breathable with built in anti-odor fabric. The asymmetrical design is a fun flair and makes it slightly different than the other basic leggings and tights I own. I chose the Under Armour Featherweight 2-in-1 Sweatshirt to complete the outfit. This hoodie is my FAVORITE! I wear it over my Threadborne Tee as I warm up at the gym and put it on again when I leave. I really like to layer this hoodie with multiple outfits because the fleece is the perfect weight – not too heavy or too light. The 2-in-1 look is so flattering and is a bit longer than the average hoodie for more coverage. Joggers & Vests is all I can say about this year’s athleisure trends! I think I layer a vest over almost every outfit I wear. Vests are an easy way to warm up any outfit while still being fashionable. The Nike Element Half Zip is a half zip that I wear just about every other day. It’s a great piece to throw over your workout tank when warming up or cooling down. Nike’s Dri-Fit technology is an excellent sweat-wicking and quick-drying material. This piece also comes in a variety of colors to match just about any outfit. The Nike Hyper Print Tight is a comfortable, warm legging with a unique ombre design making it the perfect transitional piece to wear at the gym or running errands around town. This Nike vest is popular because it’s a cute style to throw on to complete an outfit when coming to or leaving the gym. I also love this vest because it helps block the wind – and that is priceless when living in North Dakota. Anything high rise is a winner in my book, so it was a no-brainer when I chose one of the newest updates to a top seller of Nike. The Legend Sculpt High-Rise Tight is made of a thicker, softer material that is great for Yoga, Pilates, Barre, anything studio or just hanging out at home. The high waist and the ribbing in the back is a perfect contour. The pant is solid black so it can be paired with any top – another plus. The Under Armour Seamless Funnel Top is a new piece from Under Armour, but has received great feedback from our customers – including me! The seamless design is right on trend and is paired with the ever popular cowl-neck neck line. This top is fitted and super soft, perfect for warming up and savasana. Pair this with a Nike Balance tank for a yoga class and you’re all set!